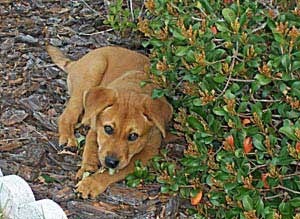 Digger sometimes fertilizes the blueberries, too. It's February in Florida and time to fertilize the blueberries . Last summer we had tremendous bush growth and harvest after applying Pure Black Castings© and VermaPlex®. This year, we're adding something new: VermaMax®. And what a great time to fertilize them! We've got a seemingly stalled front stretching across us that is putting down, soft (and sometimes not-so-soft) intermittent rain. It's a nice thing that "we" applied our fertilizer to the blueberries a couple of days ago. It's being washed in even as we speak. Now for the mix. 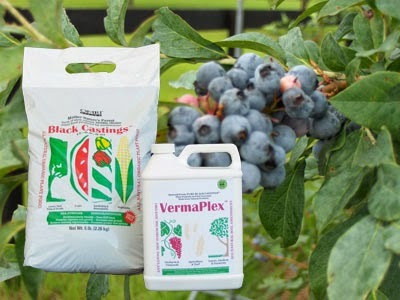 "We" mixed a ratio of 2 cups VermaMax® to 6 cups Pure Black Castings™ and spread about 2 cups of this fertilizer mixture around each blueberry plant. VermaMax®, which is chicken manure that has had a microbe face-lift from VermaPlex®, is hotter than just plain castings, so care should be taken when applying it to young plants. I'll be posting the complete low-down on VermaMax® shortly. In about two weeks, "we'll" add an application of VermaPlex® around each plant and that should do it for our blueberries until fall. About Worm Castings : Articles and use/application guides. VermaMax®: Organically composted chicken litter. For extra nitrogen and 6% Calcium.